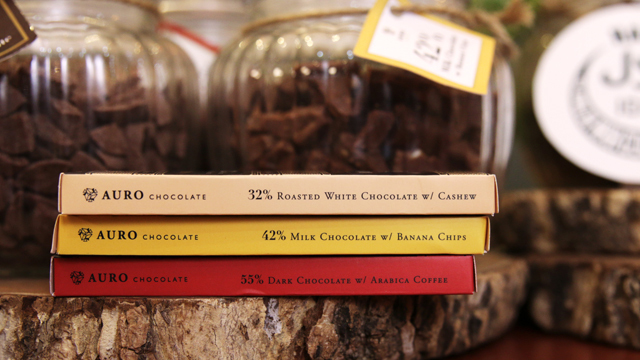 Locally made chocolate is getting its share of the spotlight. And why not? Local chocolatiers are churning out smooth, creamy chocolate bars with flavors that dance on your tongue, totally deserving a spot on any chocoholic's list. Auro is a bean-to-bar chocolate company that sources their cacao beans from the farming communities in Davao. Founders Mark Ocampo and Kelly Go were inspired by a trip to Chicago in 2010 and discovered an artisanal chocolate company in the United States which sourced their cacao beans from Davao. It was then that they discovered Davao's bounty: there were numerous varieties of premium cacao beans, which they now use to make delicious Auro chocolate bars. 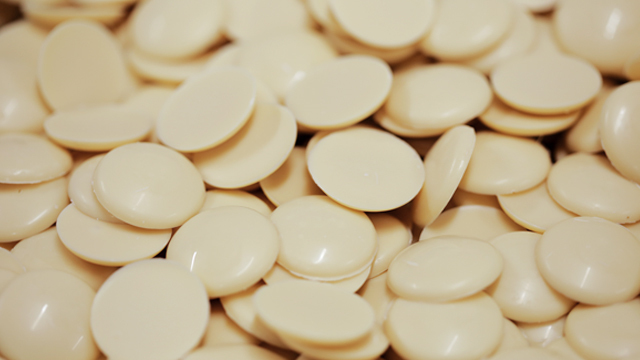 Bean-to-bar means that the whole process of creating their chocolate bars is solely done by their company. When they saw the potential of cacao in Davao, Mark and Kelly went the extra mile to prepare themselves before putting up their own chocolate company: Kelly received her Culinary Arts diploma from Le Cordon Bleu Paris in 2014 and took a four-week course at the ZDS College in Germany to learn about industrial chocolate production. Mark, who used to work for a bigtime advertising firm, studied in Germany to learn as much about chocolate as he could. Mark shares that Auro's main chocolate line is composed of three different cacao beans that can be found all over the city, namely the forastero, trinitatio, and criollo which are all perfectly formulated to create a delicious balance. 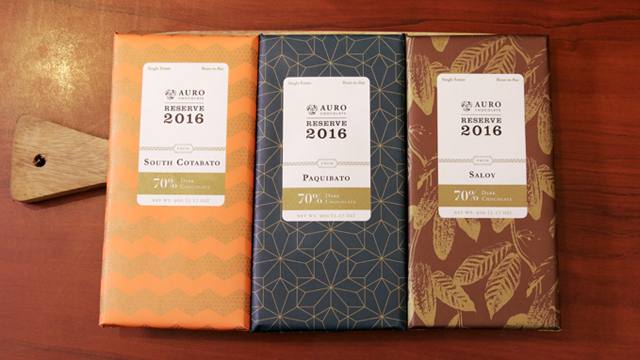 But what sets Auro apart from the different local and international bean-to-bar companies is that Auro has a wider variety of chocolate from dark chocolate in different percentages--white chocolate, milk chocolate, and even ones with crispy and crunchy add-ons like the cacao nibs, banana chips, cashews, and Arabica coffee. They made sure that there's a chocolate bar for every personality and every craving and even specifically created couverture coins for those who want to use it for cooking or baking, as well as chocolate spreads that are perfect for spreading on toast. The company also introduced their Reserve Collection, which highlights specific areas in Davao. They have chocolate bars made with beans from South Cotabato, Saloy, and Paquibato, which all have distinct flavors depending on where the cacao was harvested. South Cotabato's cacao beans grow beside pineapples, so the beans taste nutty with a hint of citrus. The Saloy beans grow beside avocados, bananas, and coconuts, and this gives the chocolate its fruity flavors with notes of citrus. 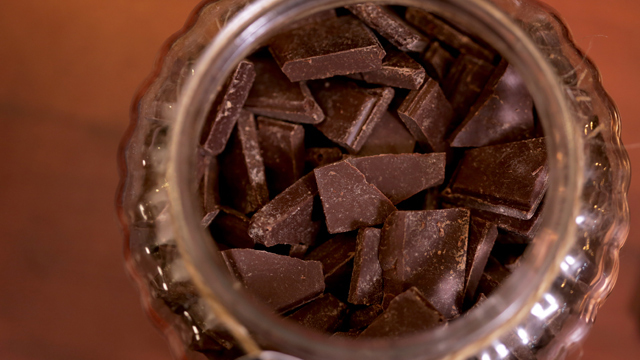 The Paquibato beans grow beside timber trees, which lends earthy flavors to the cacao beans. Auro, however, only produces as much as the harvest will provide. 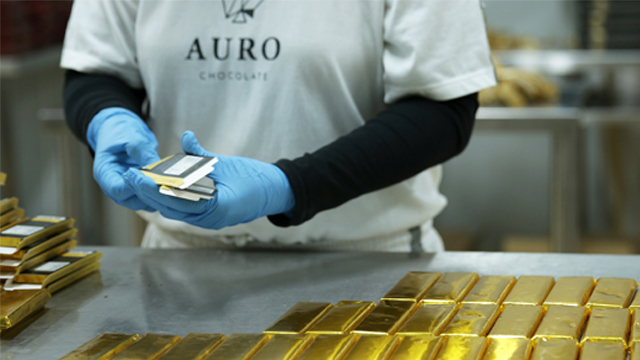 The variety of chocolate bars that they offer is what makes the chocolate company different, but what lies behind the name, is what makes Auro extraordinary. The reason why they named it Auro is because of the golden quality these decadent bars have. Mark explains, "[the word] Oro is gold in Spanish and Filipino and you'll notice that in our spelling it's Au in the front. Au is the symbol for gold in the periodic table, which is why we changed it to give it a little bit of a twist." Mark adds, "The cocoa beans and the farmers are very valuable and a lot of the times when you think about gold you don't really appreciate it in its early stages." He adds, "When you find it, it's just basically a clump of rocks and you really have to refine, you really have to polish it, in order for you to appreciate its true value when it's turned into refined gold and so for us the cacao beans and the farmers are the same. You don't really appreciate them in the beginning but then once you refine and nurture them, you can then appreciate them, which is exactly what we consider as gold." 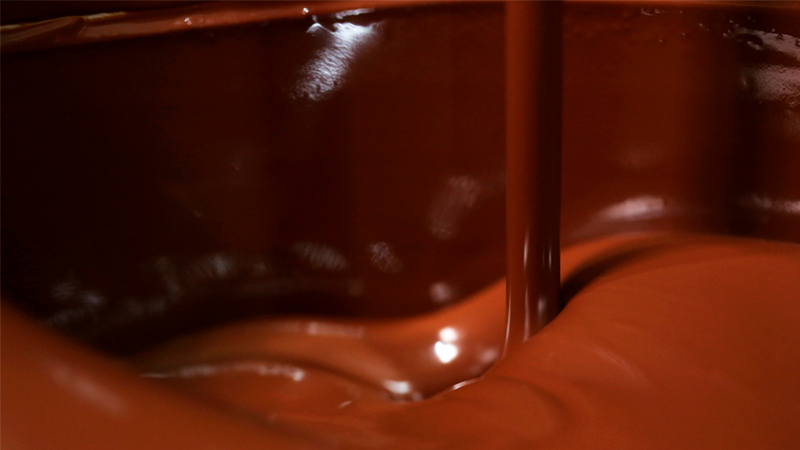 And if you've also fantasized about visiting a chocolate factory, you can see the Auro process for yourself. 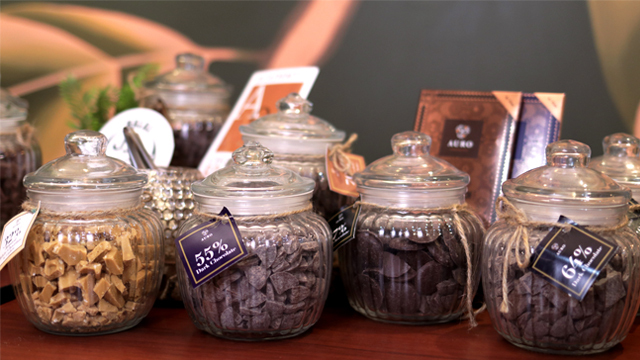 Auro recently opened their chocolate factory in Calamba, Laguna to the public. This space is designed for chocolate lovers to learn, collaborate, and appreciate Auro chocolates when it comes to their bean-to-bar chocolate-making process.